According to the GuruFocus All-in-One Screener, the following companies with market caps over $5 billion look cheap since they are trading with low price-sales ratios. Shares of American Airlines Group Inc. (AAL) are trading around $33 with a price-sales ratio of 0.33 and a price-earnings ratio of 10.88. The company, which operates over 6,000 flights per day, has a market cap of $14.48 billion. The stock has risen at an annualized rate of 15.68% over the last 10 years. Warning! GuruFocus has detected 2 Warning Signs with AAL. Click here to check it out. 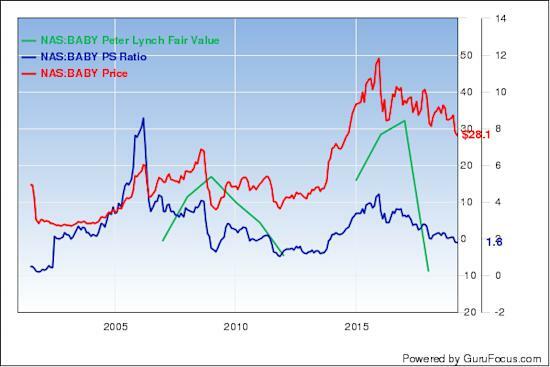 The discounted cash flow calculator gives the stock a fair value of $32.53, suggesting it is overpriced by 2%. 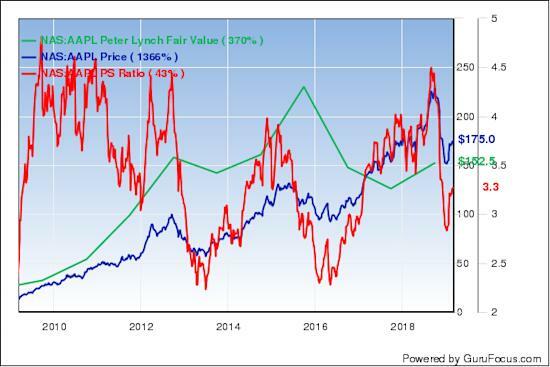 The Peter Lynch earnings line gives the stock a fair value of $17.85. 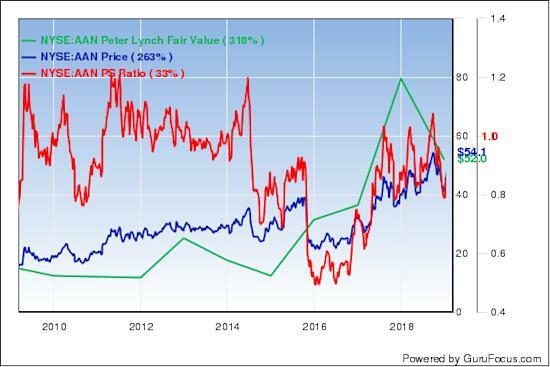 PRIMECAP Management (Trades, Portfolio) is the airline's largest guru shareholder with 14.96% of outstanding shares, followed by Warren Buffett (Trades, Portfolio) with 9.14% and Bill Nygren (Trades, Portfolio) with 1.47%. Aaron's Inc. (AAN) is trading around $54 with a price-sales ratio of 0.97. The retail company, which sells furniture, consumer electronics, computers, appliances and household accessories, has a market cap of $3.65 billion. The stock has risen at an annualized rate of 13.60% over the past decade. The DCF calculator gives the stock a fair value of $39.19, suggesting it is overpriced by 39%. 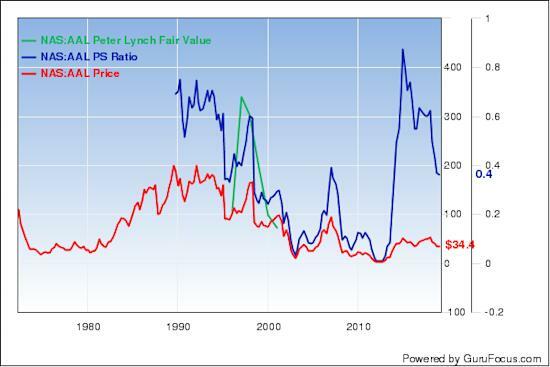 The Peter Lynch earnings line gives the stock a fair value of $65.25. The company's largest guru shareholder is Diamond Hill Capital (Trades, Portfolio) with 1.73% of outstanding shares, followed by Mario Gabelli (Trades, Portfolio) with 0.63%, Pioneer Investments (Trades, Portfolio) with 0.35% and Jim Simons (Trades, Portfolio)' Renaissance Technologies with 0.31%. Apple Inc. (AAPL) is trading around $174 with a price-sales ratio of 3.27 and a price-earnings ratio of 14.38. The company, which manufactures consumer electronic devices, has a market cap of $825.22 billion. The stock has risen at an annualized rate of 30.77% over the last 10 years. The DCF calculator gives the stock a fair value of $346, suggesting it is undervalued with a 49% margin of safety. 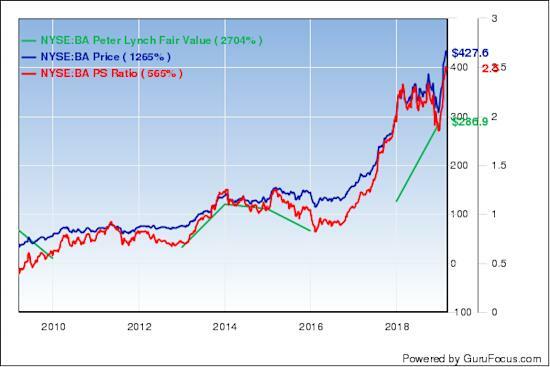 The Peter Lynch earnings line gives the stock a fair value of $165.45. With 5.29% of outstanding shares, Buffett is the company's largest guru shareholder, followed by Ken Fisher (Trades, Portfolio) with 0.27% and Pioneer Investments with 0.21%. Barnes Group Inc. (NYSE:B) is trading around $56.6 with a price-sales ratio of 2 and a price-earnings ratio of 18. The aerospace company has a market cap of $2.97 billion. The stock has risen at an annualized rate of 22.53% over the past decade. The DCF calculator gives the company a fair value of $41.89, suggesting it is overpriced by 38%. 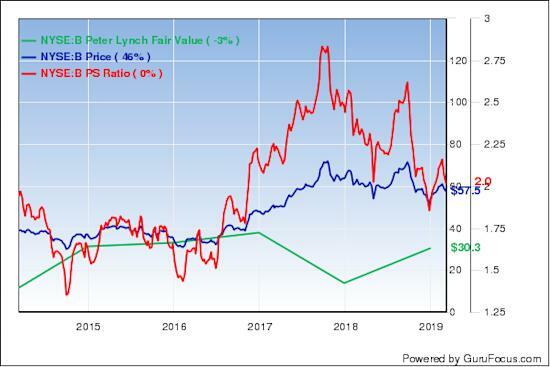 The Peter Lynch earnings line gives the stock a fair value of $19.65. The company's largest guru shareholder is Barrow, Hanley, Mewhinney & Strauss with 1.41% of outstanding shares, followed by Fisher with 0.18%, Lee Ainslie (Trades, Portfolio) with 0.10% and Simons' firm with 0.08%. Boeing Co. (BA) is trading around $423 with a price-sales ratio of 2.48 and price-earnings ratio of 23.7. The airplane manufacturer has a market cap of $240 billion. The stock has risen at an annualized rate of 31.77% over the last 10 years. The company's largest guru shareholder is Spiros Segalas (Trades, Portfolio) with 0.49% of outstanding shares, followed by PRIMECAP Management with 0.21% and the T Rowe Price Equity Income Fund (Trades, Portfolio) with 0.18%. Shares of Natus Medical Inc. (BABY) are trading around $27.25 with a price-sales ratio of 1.71. The provider of newborn health care and neurology products has a market cap of $920.44 million. The stock has risen at an annualized rate of 14.78% over the past decade. With 1.67% of outstanding shares, Fisher is the company's largest guru shareholder, followed by Diamond Hill Capital with 1.29%, Steven Cohen (Trades, Portfolio) with 0.43% and Simons' firm with 0.15%.